If you aren’t careful, you will get picked off while running the bases playing baseball. Sometimes the game gets a little sleepy and the payers and fans drift away and stop paying attention. The past decade of federal reserve accommodation in the form of low rates has removed most of the challenges from the real estate market. Now that rates have moved higher, there is a good chance of agents being caught sleeping. 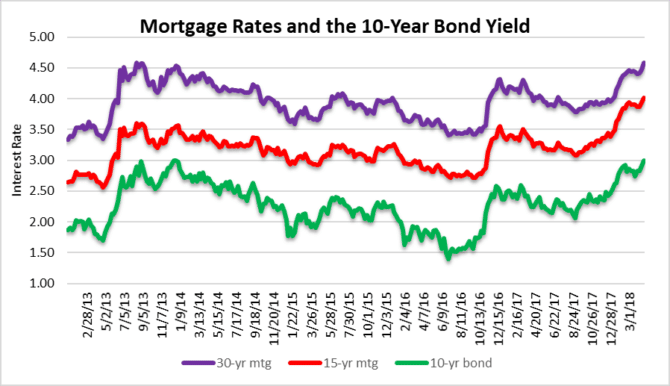 This week the ten year bond crept over 3.00% and mortgage rates have climbed to levels not seen in over four years. It may take another week or two, but we may finally exit the era of low interest rates that have kept the housing party going after the financial crisis. Higher borrowing costs will slow the pace of sales and eventually have an impact on prices, but most people in the real estate business won’t be ready. Today we will look at the latest rates and a few charts of the Fort Lauderdale residential market. 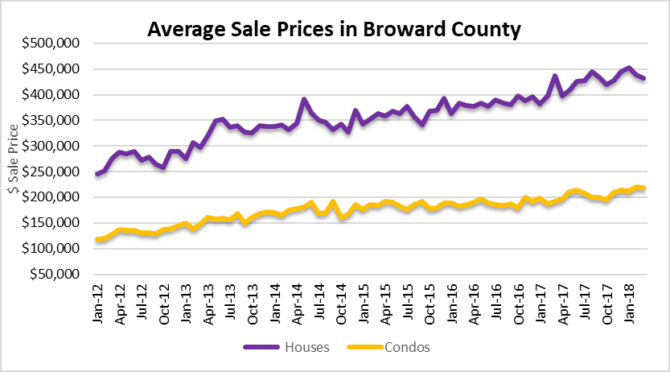 For now residential sale prices have held up in the Fort Lauderdale area, but that may be changing. You can see from the chart below that the average sale prices of single-family homes has dipped over the last few months. As rates continue to climb, expect further declines. If you are a real estate listing agent, make sure that you stay ahead of the curve and drop your prices before your listings go stale. It could be a long, hot summer if you aren’t aware of the changing market conditions. Here is a chart of the existing residential inventory in the Greater Fort Lauderdale market. The past three months of January, February and March all showed month over month gains in property listings. 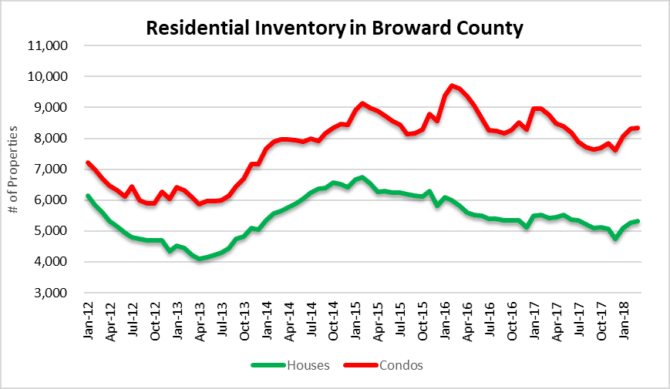 In march there were 5,310 houses and 8,338 condo properties listed for sale in Broward County fr a total of 13,648 residential properties. Today’s good read is from Bloomberg and talks about the 10-year bond yield reaching 3.00% and what it means for markets Rates going higher? This entry was posted in Investment Property, Market Insight, Mortgage rates, South Florida Real Estate and tagged condo prices, Florida real estate, home prices, housing bubble, mortgage rates. Bookmark the permalink. Both comments and trackbacks are currently closed.